Yesterday I talked about Progress. Today I want to address progress in terms of body composition improvements. I got the above graph from Alan Aragon. It represents exactly what happens in the long term when trying to change body composition either yourself or with clients. Plateaus are necessary for our survival — they occur because of two causes – psychological adaptation, and physiological adaptation. You can see by the graph that each plateau includes a period of no progress, followed by a slight “sliding back” before you progress again. 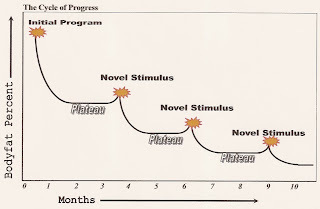 Additionally – each subsequent plateau occurs at a faster rate than the previous one, and is usually a smaller progression each time. This phase length varies from novice to experienced trainees. Novices can likely progress on the same program for far longer than an experienced trainee – although changing the routine can be useful psychologically. The key to “breaking” plateaus is to manipulate your nutrition and exercise programs SLIGHTLY. A subtle change (e.g. switching from the bike to the treadmill in your cardio workouts) is often enough to ‘kick start’ progress. The progression of a single variable like load used in an exercise can keep forcing adaptations even when other variables remain the same. A good coach is always trying to stay one step ahead of any plateaus – by manipulating the training variables to ensure continued progress. For example, in our fat loss programs one of the tools we use is to adjust the rep range every single workout (using undulating periodization) and change the exercises completely every 4 weeks. You could also change the load every workout, the nutrition program every four weeks, and also change the resistance training and energy system portions at the same rate. Basically a sixteen week program is a sequence of four, four-week programs, and can easily be adjusted to become a 24 week program for the beginner. The bottom line is to remember that plateaus are not necessarily a bad thing. In actual fact, our ultimate goal IS a plateau – to reach a favorable body composition range and stay there. We now live in the information age… you can buy a book on any subject you want and have it delivered by tomorrow. There are hundreds of thousands of websites on almost any topic you can think about. It’s amazing. 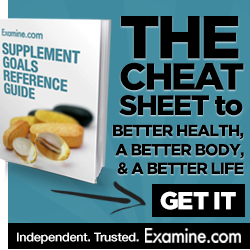 I get asked a lot – why so much conflicting advice on fitness/fat loss etc? And honestly — when you get right down to it — I don’t think there really is that much conflicting advice – most good people agree on 90% of their topic. I think it’s that people lack the ability to FILTER good information from bad. So in the information age — how do you filter information? I mean, at this point there is so much information available – that you NEED to filter out as much as you take on board. My personal filter is to heavily prioritize information that comes from “Real World” Practitioners whose livelihood depends upon delivering results or solving problems (and I’m a fanatic for proof). It’s that simple. I’m sure that I miss out on “some” information by ignoring other sources — but I think it’s an acceptable trade off. 99 times out of 100 who will have the better information on strength training ?– a 19 year old who has only ever trained himself — or a professional coach with 19 years of full time experience? Who knows more about marketing – a personal trainer or a direct response marketing expert with 30 years of experience in the field and a seven figure income from his results? If you had cancer – would you prefer to consult with one of the top oncologists in the country – who makes a living fighting cancer and saving lives? Or would you listen to an internet based conspiracy theorist? In today’s world, filtering information might be a more important skill than finding information. “People who are cocky and arrogant say, “I know that” and move along. Q: I’ve heard in a previous interview where you mention that billing ‘by the hour’ is irrelevant when it comes to training people. I just can’t get my head around this — how do you charge people and why isn’t time still a factor? Do you call the workouts “mini-sessions” or something? A: When you want to travel cross country in the USA — you can choose a flight, or you can choose a bus right? The bus takes way longer than a flight — but costs less. It’s not about the length of time — it’s about the destination — the result — and how it is delivered. In this case — it’s the REVERSE of billing by time — as the shortest time costs the most money. A haircut? The barber or hairdresser completes the task and is paid by the task – not by how long it takes. A doctor? Does he or she charge you more if they talk to you for longer? Experts don’t get paid by the hour – they get paid by the result. Back to training – where did an hour of training come from anyway? Is there a science journal out there that I don’t know about that showed an hour of training to be more effective than 50 minutes? An hour is just a measure of time. What you are really doing within that hour is X number of sets of Y number of reps right? Let’s say you do 8 exercises, 3 sets of 10 reps each for 24 total sets and 240 total reps.
Then someone else hires you — and when designing their program you come up with 7 exercises, and 3 sets of 8 reps each. 21 total sets and 168 total reps. Does the second client get a discount because they did “less”? Of course not. You are using a tool to deliver the result. If you design a perfect program that can be done in 45 minutes — do you add another 33% more work to fill in the time (and thereby move away from your perfect program)? I’d even go beyond that. The lowest paid people in the world think that they get paid for the hour of work. That’s why they stay low paid. The guy who works at the grocery store thinks he’s getting paid for the hours he stands there. And until he changes that paradigm he’ll always be a low paid ‘by the hour’ worker. More successful people think like Jim Rohn and they think they get paid for the value that they create within that time frame. The most successful people understand that the time spent is irrelevant, it’s ONLY the value. So they no longer think in terms of time — and if they do — it’s in reverse — that getting the job done faster is worth more. If I can deliver the perfect training program to get your result in 30 mins, and another coach needs an hour — am I not worth more? I can deliver the result in half the time that they can – I should be worth at least twice as much. In training (and in most things – including business) the result is the ONLY thing that matters — designing programs or charging ‘by the hour’ is not thinking about value first. I actually pride myself on making the workouts no longer than they need to be. In my opinion doing one extra set is far worse than not doing enough. So what do I call a 45 min training session? Same as what I call a 35 min training session. A training session. Write workouts that work and deliver results. Don’t write workouts to fill in a slot of time. I think there are definite parallels between work and fitness training. Over the past few years I think as a whole, in both areas, we’ve confused working “hard” with working long. Think about someone you know who you’d describe as working hard for a living. Now – do they really work hard – i.e. back breaking, intense physical labor — or do you mean that they work long hours – nights and maybe weekends? Working “hard” and working “long” are not the same. And neither one means working effectively. You could make the case that someone who is working long hours and weekends to achieve their objectives may not necessarily be working hard at all — they may be doing completely ineffective activities. In addition, their rate of actual quality work output may be very low on a minute-by-minute basis. Or quality output may not be frequent enough — so they are trying to compensate by increasing their total volume. But just increasing the volume of an ineffective, low-quality (i.e. intensity), infrequent activity isn’t helping whatsoever. Effective, results-producing work is not dependent upon the total volume of work primarily. Are you focused and striving to do more work/lift more weight/do more reps in the session? Are you training regularly? (in all studies – frequency of exposure to a stimulus is a primary key to success). Once you have effective and technically sound exercise, performed with appropriate intensity on a regular basis – then you can think about adding volume. Doing more work can’t replace effectiveness, intensity or consistency.